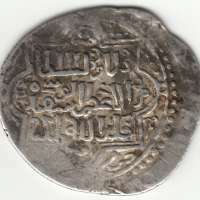 The Ilkhanate, also spelled Il-khanate (Persian: ایلخانان‎, Ilkhanan; Mongolian: Хүлэгийн улс, Hulagu-yn Ulus), was a breakawaystate of the Mongol Empire, which was ruled by the Mongol House of Hulagu. It was established in the 13th century and was based primarily in Iran as well as neighboring territories, such as present-day Azerbaijan, and the central and eastern parts of present-day Turkey. The Ilkhanate was based, originally, on Genghis Khan's campaigns in the Khwarazmian Empire in 1219–1224, and was founded by Genghis's grandson, Hulagu Khan. In its fullest extent, the state expanded into territories which today comprise most of Iran, Iraq, Turkmenistan, Armenia, Azerbaijan, Georgia, Turkey, western Afghanistan and southwesternPakistan. 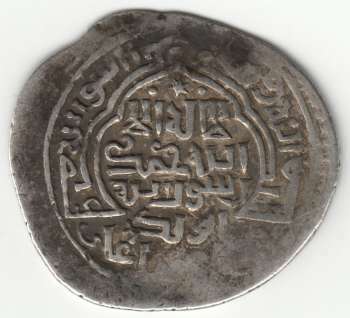 Later Ilkhanate rulers, beginning with Ghazan in 1295, would convert to Islam. 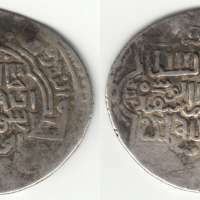 Abu Sa'id Bahadur Khan (June 2, 1305, Ujan – December 1, 1335) (Persian; Urdu; Arabic: ابو سعید بہادر خان ) also spelled Abusaid Bahador Khan, Abu Sayed Behauder, was the ninth ruler of the Ilkhanate state in Iran (1316–1335). Legend in plain and dotted circle within mihrab-like ornament. Legend in double plain looped square, legend in four inner segments starting above and in outer segments starting above/above r., plain and dotted circles. Thank you ReZa MirZaie for helping with the Arabic inscriptions.